Executive Chef Ryan Lowe put finishing touches on pork ravioli with chipotle cream and grilled bok choy during the Iron Horse Chef Competition on Saturday at the Durango Farmers Market. 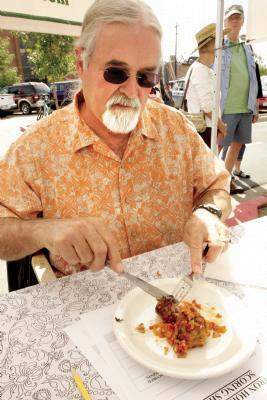 In Durango, food can go from farm to table in hours. 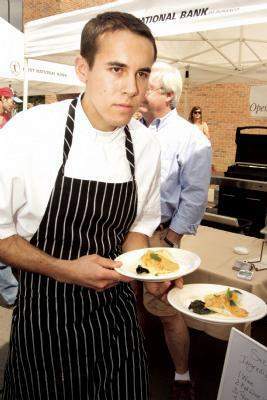 At the second annual Durango Iron Horse Chef Competition, produce was picked in the morning, driven to the market, purchased by a chef and cooked and eaten on site. This is fast food that fills the belly and nourishes the community.The event, organized by Healthy Lifestyle La Plata Coalition in cooperation with Colorado State University Extension, was a celebration of three interconnected groups: Durango Farmers Market vendors, regional food producers and chefs who use local food in restaurants. Two cook-offs earlier in the season culminated Saturday with the top two chefs meeting in the finals. The contestants were Sean Devereaux, chef-owner of Guido's Favorite Foods, and Ryan Lowe, executive chef and new general manager of Ore House. The challenge was to buy ingredients at the market and use them to cook four to five dishes in less than an hour. The chefs had 20 minutes to shop and $75 to spend. Their challenges included dodging people, pets, strollers and an entourage of judges and media. Between the two chefs, they shopped at almost every food booth at the market. "I know I couldn't get through the market in 20 minutes," said Judy Cole, a vendor for Cole Ranch and a judge for event. "Talking to friends and hanging out makes rushing impossible." Each chef was required to use the same "secret protein," which turned out to be pork tenderloin, ground pork and hickory-smoked bacon from Cole Ranch. The chefs were allowed to bring five ingredients from their own kitchens, not including basics such as salt and pepper. The raw ingredients at the peak of the harvest season were stunning in a rainbow of colors, and the scent of roasting green chiles from Sutherland Farms filled the air. "That's the smell of fall," said judge Marcey Olajos, a random shopper selected from the market to help judge the event. The chefs had one hour to cook, using any portable device they could fit inside a makeshift outdoor kitchen. 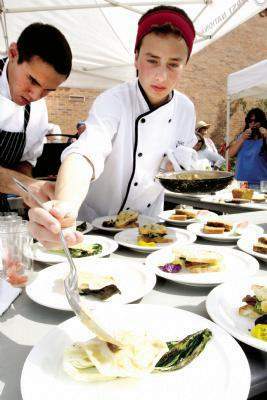 Both chefs, along with one sous-chef each, were calm with a Zen-like focus in spite of a lively crowd of onlookers. Devereaux was asked which was more stressful: cooking under pressure at a contest with cameras running and people asking questions, or a very busy night cooking at Guido's. "It's the same," he said. "Last night, I swear big groups of people waited to rush in together, like, OK, now! That's tough." Lowe wowed the crowd and judges during the cooking countdown by baking zucchini bread. Small pans allowed a quick baking time, but a bad connection to the toaster oven meant he had to improvise. The pans went into the covered barbecue instead. La Plata County Commissioner Wally White, a judge at the event, told the audience that he had a special connection to the market, and tangentially the quality of the food. He said he supplies manure from his llamas to some of the farmers. "Watching these chefs right now, it just demonstrates to people what can actually be done with these products, and the incredible diversity in our agricultural community," said White. Cole scribbled notes as she watched the chefs race the clock. "I want to recreate this at home," she said. The public eventually can try the recipes, too. Darrin Parmenter, La Plata County Extension director, said a cookbook with all the Iron Horse Chef Competition recipes will be published around the winter holidays. As the mouthwatering plates were prepared before their eyes, the judges joked about competing to eat the most food. "The winner could receive some expanding pants," said Parmenter. The judges were tasked with ranking each chef as a whole for taste, creativity, presentation and originality in use of market ingredients. Devereaux's first two dishes were bread-based: bruchetta, a grilled ciabatta bread slice drizzled with oil and topped with red and yellow tomatoes and sea salt; and panzanella, a bread salad with bacon, fresh herbs and cucumber. The Cole Ranch bacon added a great flavor, surprisingly without a heavy or greasy feel. "Quality bread (ciabatta from Bread) is an important ingredient in these dishes," said Devereaux. Next came the meat: Involtini was rolled, stuffed pork, accompanied by sautéed Swiss chard in a creamy sauce. Devereaux's Insalata di Finochiona (fennel salad) had a strong, unique licorice flavor that was a refreshing balance to the heavier, creamier dishes. Polpetine (pork meatballs) sat in a sweet, bright red and orange sauce of carrots and tomatoes, and the pork was light and flavored with sage Devereaux picked in Buckley Park. Dessert was a fruit course of melon and peaches grilled in butter. "Italians love to eat fruit at the end of meals. It's light and easy on the digestion," said Devereaux. Lowe's offerings followed a theme of breakfast, lunch and dinner prepared in an hour. First was zucchini bread with espresso whipped cream. The bread was light, and had a delightful crispy crust. For lunch, a simple BLT allowed the market's quality ingredients to shine. An aperitif drink before dinner was a refreshing melon soda. It was a creative, Asian-inspired drink with melon juice, soda, agave nectar and small chunks of watermelon for a sunset-pink color. The main course for dinner was a pork ravioli with a chipotle cream sauce on grilled bok choy. Here, Lowe graciously turned over the microphone to his sous-chef, Alex Max, 16, the captain of the ProStart culinary team at Durango High School. "I'm pretty competitive. I knew Sean would do something Italian, so I did a ravioli, but with a twist," Alex said. The twist was the Southwest-inspired spicy bite of chipotle, and the fact that he used wonton wrappers as the pasta. Alex also brought creativity to the second dish. "My mother's grilled peaches are my favorite," he said. His dessert was a custard-style cold cream with eggs, vanilla bean, honey and strawberries accompanied by a lightly grilled peach half. And the winner in a close tally was Ryan Lowe of Ore House. He received an Iron Horse Chef Competition jacket as a traveling trophy. The market food that inspired the chefs, fed the judges and wowed the crowd was a continuous loop of inspiration. "In the last cook-off, one of the chefs used fennel pollen," said Durango City Councilor Christina Thompson. "I hope people can walk away from this and say, 'Wow, I'm going to buy that at the market and try it.'" ""Watching these chefs right now, it just demonstrates to people what can actually be done with these products, and the incredible diversity in our agricultural community.""